I’ve read this series since the beginning and have to say that I recommend reading the books in order. In order to understand how the characters have gotten to this place in their journey, you need to have the background stories. The sleuth in this series is Delaney. She has moved from Kansas to Scotland for a job at The Cracked Spine, a bookstore of some repute. Delaney has found her new home in Edinburgh and is engaged to the love of her life. This is the second Christmas coloring book to be released by Jade Summer in the last few weeks. I wasn’t sure I was ready for another book if it was similar to the last one. I went ahead and bought it and I am glad I did so. This coloring books is quite different from the last. It has fewer unique designs but has two copies each of the 25 included. The designs are focused on people and holiday traditions rather than on trees and gifts and so forth. I can see quite a few images that ring home to me either from when I was a child or now that I have had both children and grandchildren. My favorite is one of the grandpa giving his grandchildren horsey ridges while down on all four. All three generations of my family have had this type of fun. Santa makes an appearance and there is both a church and a nativity scene. 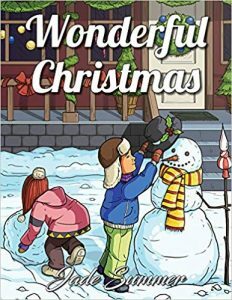 All in all, a great coloring book for the holidays and one that I would leave out for family to color along with me. The designs are detailed with full background. Some contain small and intricate areas to color but overall, I don’t find it a difficult book to color. There are two copies of each design included in the book. There are instructions (once you have purchased the book in paper format to be able to download the .pdf version. I think that’s great but I am reviewing based on the paper and the book as you receive it you order the paper version. As with other books I have read in the Lila Maclean Academic Mystery series by Cynthia Kuhn, I found that reading this book was a several day read. It isn’t that the book is difficult to read but rather, I think it is because the setting (a private small college) is foreign to me. 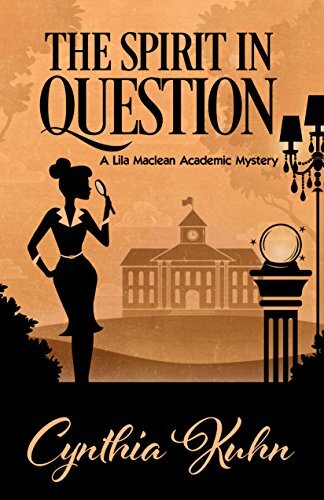 It took several chapters for me to understand why our sleuth (Lila) was involved in the production of a musical play. Once I understood that, I was able to relax and go with the flow. The play sounds hysterical and I could only wish I could see it in reality. Lila feels that it is doomed to failure and is working hard with the director to save it. 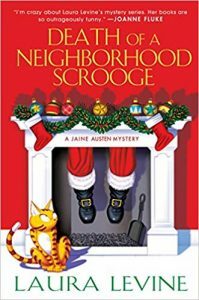 T he Jaine Austen mystery series is a new to me series. Read this book, it wasn’t until halfway through that I realized there were many other books in this long term series. That means that this book can absolutely be read stand-alone. 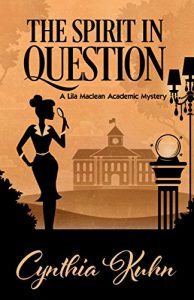 Our sleuth is Jaine Austen, a writer (though of ad material and not wonderful books of the Regency period.) Jaine is talked/conned into house-sitting by her best buddy Lance. Her cat, Prozac, finds other digs and settles in quite well. 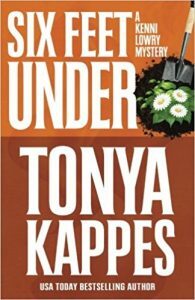 When a murder occurs (what else in a cozy murder mystery) and Jaine comes under suspicion (ditto cozy murder mystery), she kicks into high gear to solve the crime. Only problem is, just about everyone who knew the victim had really good reasons to knock him off. 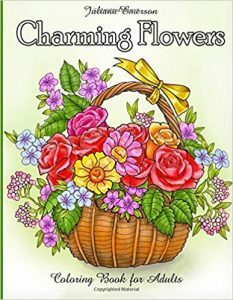 This is another coloring book in a series of flower inspired books by Juliana Emerson. The coloring book, as usual, is fun to color and includes a wide variety of flowers both by themselves and also in vases. I must admit that now that I’ve seen Ms. Emerson’s “Fantasy Kingdom” coloring book, I’m hoping that she will do more with fantasy and figures in the future. The flowers are pretty but I’m really impressed by the fantasy book. The designs have a nice level of detail but are done without backgrounds. That makes them a quicker to color project. The designs all have framing lines which provides for a more finished looking project. I want to note that the Amazon owned company, CreateSpace is now being folded into KDF (Kindle Direct Publishing.) These independent artist books will move along into the new group shortly if they have not already done so by now. According to what I’ve read, the same warehouses and printing presses will be used. No mention is made of paper but one assumes that it will be the same as well. 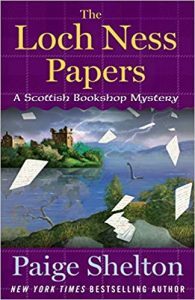 I don’t know if the copy I received was printed by CreateSpace or by KDP, but I can say that it is the same paper I am used to receiving (for years now) from CreateSpace. That is: thin, white, slightly rough, and non-perforated. I will continue to check books as I receive them and will note, in new reviews, if the quality changes. Confusing read and is it really Christian in nature? I must admit that I was confused by the plot of this book. Right from the beginning, I had the feeling of being brought in during the middle of a scene that had been played out elsewhere. 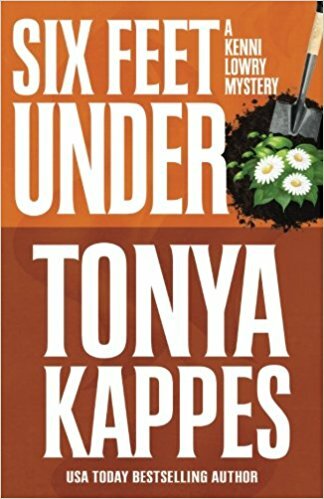 My first thought was that the book was part of a series, so I went looking for the earlier book. Nope – it is a standalone book by an author who has written a series. 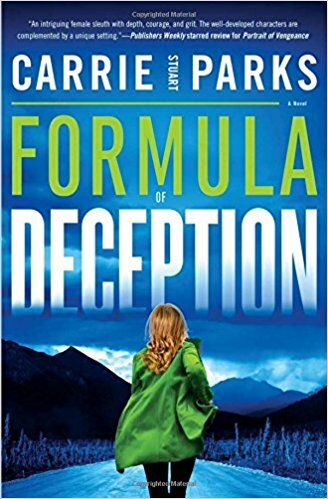 I read through the book and as it progressed the main character kept doing things that didn’t make sense and she seemed to be headed for disaster. In addition to her personal quest (to find her sister), there is another subplot that involves shadowy doings during World War II. I never really put these two things together other than they were in the same book and the same present day individual was involved in solving the issue. Marty Noble has been one of my go-to coloring book artists since I first became entranced by putting colored pencil to paper as an adult. Her designs are beautiful and inspiring. In the past, for the most part, the designs had detail but were not what I consider intricate. It’s interesting for me to see that Ms. Noble’s art has been evolving lately. I have seen more and more intricate elements beginning to dominate her scenes. It’s is almost as if she has taken a few steps back (in her mind) from the scene she is creating and is providing a more lush background and definitely more detail in the overall subject of her design. 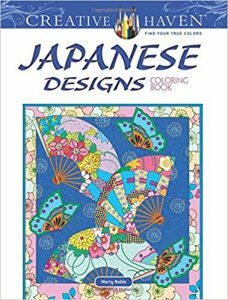 With “Japanese Designs”, the intricate and detailed part of this new style is evident. If I didn’t see her name on the book, I might not have known it was her artwork. 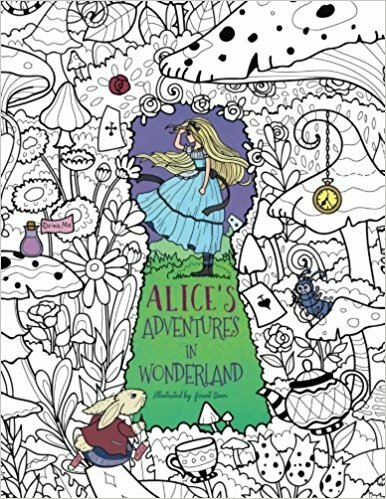 The designs are beautiful and should be fun to color though perhaps more time intense than others of her earlier books. The artwork is based on patterns, fabrics, home goods and artwork from various Japanese periods of art. I’ve noticed that the paper quality over seems to change quite frequently on the Creative Haven line. Because of that, if you buy one of these books, it may be slightly smooth or slightly rough depending on when and where it was printed. I’ve found that coloring medium, including pencils, work similarly with both slightly rough and slightly smooth paper from Creative Haven. In this case, my coloring book pages are slightly rough. So, I have so many to choose from. For me, this newest one is one of the best ones yet. It is an interpretation by artist Forest Diver. 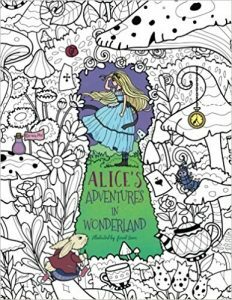 This is my second coloring book by this artist (who publishes under Storytroll/Julia Rivers imprint) but it will not be my last. I appreciate his design take in general and, for me, it translates into a wonderful and slightly more modern looking land for Alice to explore. The designs are detailed and in some cases have some intricate areas to color. That you get 40 completely unique images in this book and at the price it is makes it an outstanding value as far as I am concerned. 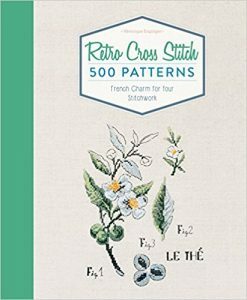 I have cross stitched for many years and own a lot of patterns and encyclopedia style compilation books. I am a little bit jaded when it comes to new design books. In many ways, the designs all begin to look the same. This book, is another thing altogether. I have recently purchased the Fables and Fairy Tales by Ms Enginger and based on how much I enjoyed that book, I pre-ordered her Christmas book and picked up this book as well. The designs range from small to full size pages. 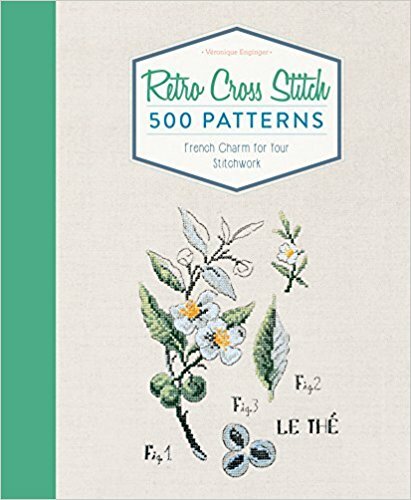 You can design your own sampler style project using any number of the designs in this book and they will all match well together. The designs are definitely retro but will a European flair that I have not seen in a US published book before.